My baby girl turned three this week, making it as good a time as any to reflect on our life together. Kevin and I adopted Galen in November 2010, when she was just eight weeks old. I hoped she would fill the void in my heart – and my life – that was created by Gryffin’s sudden passing. He was our first child, and we’d considered him pretty close to perfect, so Galen entered our life with a heavy burden to bear. That I’d tethered her with it was completely unfair, but she’s borne it beautifully, if quirkily. What’s more, she’s taught me far more than I’ve taught her. I taught Galen basic obedience: to sit and to stay, to lie down and to come. I tried to teach her to shake, but at that I failed. She learned from a wonderful dog walker. Galen taught me that just as people march to the beat of their own drum, dogs do, too, and that I should embrace marchers no matter their species and not attempt to redirect them. She taught me that dogs can be just as stubborn as people, and reminded me that one must choose her battles wisely, a lesson that comes in handy when you’re the mother of two stubborn (human) daughters. She taught me that a dog in the home, by its very presence, helps teach children empathy and respect, compassion and responsibility. At least four million abandoned and unwanted dogs and cats are euthanized in shelters across the United States each year. That’s more than nine-thousand each day, about half the population that enters the shelters. Yet according to a recent study by PetSmart Charities, eight in ten Americans vastly underestimate the number of annual deaths, putting it at one million. What’s perhaps even more devastating, according to animal welfare experts, is that a majority of those killed – up to ninety percent – are healthy and adoptable and would make great pets. But because not enough Americans adopt from shelters, because people relinquish their dogs and cats for myriad reasons, and because too many Americans don’t spay or neuter their pets, shelters are so overcrowded they euthanize simply to create space. 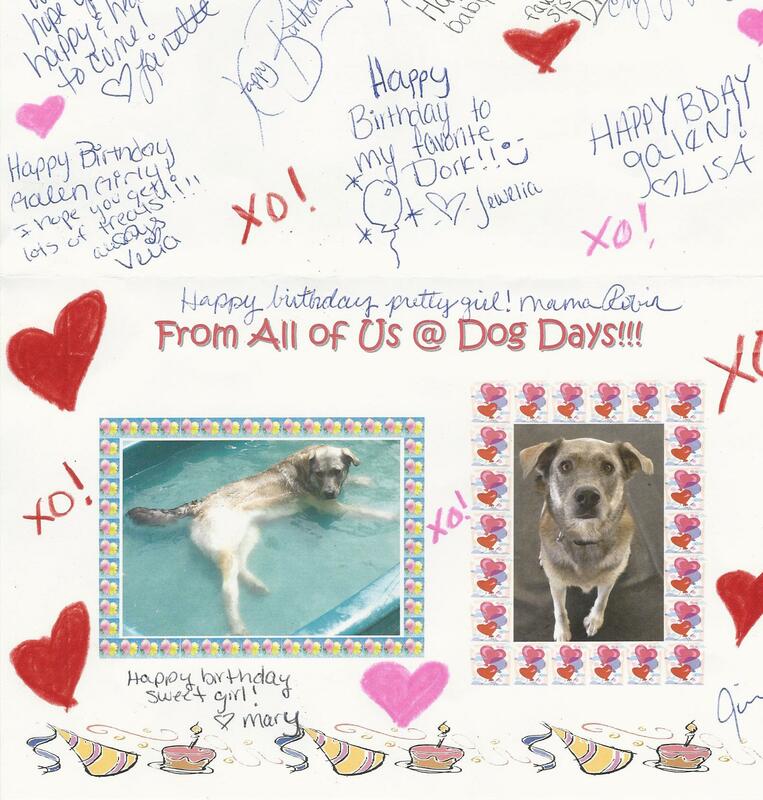 A birthday card from some of Galen’s favorite people — the ladies who play with her at daycare. This entry was posted in animal shelter, dogs, Galen, Gryffin, musings. Bookmark the permalink. Yea! happy Birthday, Galen. My birthday is next week. Let’s celebrate by digging in the dirt one of these days…. Happy Birthday right back at ya, Calvin! A dirt-digging celebration should definitely be in our future. Woo-hoo!